Hiab, part of Cargotec, is inviting the world’s best crane drivers to compete in the 2015 World Crane Championships. The winning driver will win a prize worth €25,000. The first qualification round took place during the Vestfyn Traekker exhibition between 23–25 May in Denmark. Further qualification rounds will continue in a total of 11 countries around the world. The winners of the qualification rounds will proceed directly to the finals, which will be held at the Commercial Vehicle Show in Birmingham, United Kingdom on 14–16 April 2015. There, the winner of the final will receive a cheque of €20,000 for the purchase of his or her next crane, and a traveller’s cheque of €5,000. The competition involves performing difficult manoeuvres with a truck crane in the quickest possible time. However, winning the competition demands more than speed. The tasks include toppling water-filled drums with a load while keeping the crane below a crossbar. The driver has to work carefully and accurately to avoid touching the obstacles. Mistakes incur time penalties and, in the worst cases, disqualification. The competition track was developed and tested by an extremely experienced crane driver, known only as ‘Eric’. “Our test driver ‘Eric’ set a fantastic time during practice. It will be fun to see who is the first to beat it”, says Carl Gustaf Göransson. 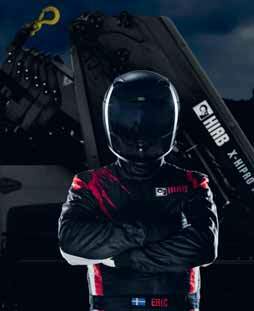 In order to guarantee identical conditions for every crane driver, only HIAB X-HiPro 192 cranes will be used during the competitions. With its innovative features, the HIAB X-HiPro 192 is the most state-of-the-art model on the market, delivering unrivalled performance, speed and precision, and allowing the crane driver to focus on getting the job done. If participating crane drivers wish to prepare for the qualifications, a practice track is easy to set up using ordinary Euro-pallets and water drums.